One of SoMAS’ paramount objectives is to educate and train students to become the next generation of marine and atmospheric scientists, environmental resource managers, and citizens who possess a fundamental grasp of environmental issues and the choices that society faces in handling these issues. The first undergraduate degree offered through SoMAS was a minor in marine sciences established in 1988. In 1992, an Oceanography and Environmental Studies track was established in the Multidisciplinary Studies undergraduate degree program. Also in that year, the Marine Sciences Research Center (MSRC) offered its first undergraduate major, as the University’s Institute for Terrestrial and Planetary Atmospheres (ITPA) was transferred to MSRC, bringing with it the Atmospheric Sciences/Meteorology BS degree program. Over time, other undergraduate degree programs followed: a BA in Environmental Studies (2001) and a BS in Marine Biology and a BS in Marine Vertebrate Biology (both in 2005). The Environmental Studies major is designed for students anticipating a non-science career but one with a strong environmental bent, e.g., environmental journalism. The Marine Biology and Marine Vertebrate Biology degrees prepare students for a career in the sciences or environmental management. From May 1992 through December 2008, 174 students have graduated from SoMAS with an undergraduate degree. MSRC’s first graduate degree program, the Marine Environmental Studies Program (MESP), was authorized in April 1970 and produced its first graduate in May 1971. The MESP program was a Masters of Science program designed for practicing professionals and recent college graduates with varied academic backgrounds. Its curriculum offered a strongly interdisciplinary examination of the diverse factors affecting the marine environment and was designed to prepare students for careers in the then-rapidly expanding fields of coastal management, environmental monitoring and protection and resource management. During the 1975-76 academic year, MSRC conducted an internal review of the MESP program. As a result of this review, the program name was changed to “Marine Environmental Sciences Program” and the program’s focus was shifted more towards hard science, with somewhat less emphasis being given to management and specific environmental problem-solving. In April 1978, the Board of Trustees of the New York State Education Department approved MSRC’s Ph.D. program in coastal oceanography. The following September, the program was approved by New York Governor Hugh Carey. The Ph.D. program graduated its first two students in December, 1981. In 2007, as MSRC was renamed the School of Marine and Atmospheric Sciences, our graduate programs were re-titled to more properly reflect the unified educational experience within the school that is offered to both marine and atmospheric science students. At present, SoMAS offers both MS and Ph.D. degrees in Marine and Atmospheric Sciences, with concentrations in either the marine or atmospheric sciences. Since 1971, SoMAS graduate programs have produced 697 graduates; 574 received a MS degree, 184 received a Ph.D. and 61 received both degrees. The alumni profiles below highlight a few of our graduates. Mark Nepf was an MS student in the Dvarskas Lab of Environmental Economics from 2015 to 2017. During his time at SoMAS, he worked on a hedonic analysis of Suffolk County residential real estate, with a focus on the potential impact of coastal water clarity. By determining if improved water clarity could positively influence housing values, his project aimed to provide an economic measure of the benefits of coastal remediation. After graduation, Mark accepted a position with Resources For The Future, where he is working on similar environmental valuation studies that look at the impacts of air pollution. He credits his time spent at SoMAS helping him land on the job path he hoped for. Photo above: Erica Cirino ’15 on a research expedition. Writer, artist, runner and licensed wildlife rehabilitator — this is how Erica Cirino ’15 identities herself. Perhaps survivor should be added to the description. Her childhood memories are dominated by discord. Voices escalate in anger and accusations; a door slams, followed by the sound of a woman sobbing. A car starts up in the driveway; a man is bound for who knows where. When the little girl wakes up in the middle of the night, she sees her father on the couch. Again. The days that follow bring more of the same — ongoing family drama that no child could be capable of stopping or escaping. This is how Erica remembers parts of her childhood — a painful chapter that will stay with her always but was instrumental in making her the strong woman and successful wildlife journalist that she is today. While her parents didn’t get along with each other, they did each stand by her side as she grew up. While at times her life wasn’t easy, Erica is grateful for her parents, who offered her their support and resources, cheering her on at track meets, buying her art supplies and encouraging her to pursue her natural talents. But Erica also dug deep into her personal well and at a very young age found a way to cope with domestic upheaval. She chanced upon an inviting world, just walking distance from where she lived. This haven, Caumsett State Historic Park Preserve in Lloyd Neck, New York, was inhabited by chattering squirrels and nervous rabbits, scolding blue jays and drumming woodpeckers. With a notebook and sketch pad in hand, Erica recorded the wonders of the natural world. Caumsett was where she could retreat into an alternative reality. As Erica got older, she found the preserve offered her a new kind of escape — running. At first she pursued it to put distance between herself and her pain. Eventually it became a need that she satisfied by becoming a competitive runner in high school. Cold Spring Harbor High School required seniors to perform 20 hours of community service. Serendipitously, Caumsett had a wildlife hospital, so Erica volunteered there. She found the experience both uplifting and transformative: In the process of rehabilitating sick and injured wildlife, Erica learned how to heal her own emotional wounds. She worked with opossums, turtles and other small mammals, but especially enjoyed caring for injured hawks and owls. Learning about the creatures’ life histories was soothing, she says, and she came to view them as new family members who depended upon her for their survival and would never abandon her. Although Erica found the work rewarding, it was not without its challenges. “It was a dirty job, one in which I was on my feet all day, got kicked and scratched, and was exposed to the elements,” she says. “But it taught me how to deal with loss and death, and perhaps it braced me for the loss of my father from my life,” she says. Erica says working with wildlife filled a hole in her soul, and she became a licensed wildlife rehabilitator at age 16. By this time, running had also taken on a greater significance in her life, becoming far more than a coping mechanism. As Erica’s reputation as an athlete grew, 30 colleges lined up to offer her track and cross-country scholarships. She pondered her options, but in the end her love for healing wounded animals won out. Erica decided to live at home, continue to rehabilitate animals and apply to Stony Brook Southampton, where she could study marine vertebrate biology and further her career in wildlife sciences. Erica was accepted but shortly thereafter, as a result of New York State budget cuts, Stony Brook Southampton relocated its undergraduate programs and students to its main campus where she received her BA in Environmental Studies. The change in venue did not deter Erica, who immersed herself in her studies. She had loved science and writing and now she looked to combine her thirst for scientific knowledge with her creative nature and become a science writer. East Setauket, NY; Safina Center: Carl Safina talks with Stony Brook University alumni and freelance science writer and artist Erica Cirino. It was in Professor Heidi Hutner’s Environmental Writing and Media class in 2012 that Erica met the person who would most influence her academic and professional career, Carl Safina. Safina, a renowned conservationist, author and founding president of the non-profit organization, The Safina Center, was guest lecturing about the human connection to nature. Little did Erica know at the time that this encounter was the beginning of arguably her strongest and most formative professional relationship —one that would allow her to flex her literary muscles and truly discover both the scientist and the writer within. Erica thrived at Stony Brook and enjoyed a college career that most students would envy, going on to make dean’s list every semester and winning seven awards. In 2014 alone, she landed three awards — the Sustainability Studies Program Director’s Award for Academic Excellence, the School of Marine and Atmospheric Sciences’ Undergraduate Honors Award, and was named the Stony Brook University Undergraduate College of Leadership and Service Creative Expressions Contest Winner. Another plus, she says, is that the program required that she would only have to spend a year and a half in the classroom. After some consideration, Erica decided she wanted to become a freelance science writer. Erica felt confident she could embark on this new course of study, as her competitive running background imbued in her strong time-management skills, self-motivation and drive. “I can do this,” she remembers thinking. Through her studies, she honed her photography skills but sought to become a better writer. Her final master’s project, which required her to find and cover a big story, gave her that opportunity. For her project, Erica highlighted the 2014-2015 avian influenza epidemic. She traveled to Wisconsin, one of the Midwestern states where the poultry industry was adversely affected. As her full-time freelance writing career took off in 2016, Erica began writing for a greater number of publications, including National Geographic’s Voices blog. She focused heavily on ocean issues, in February 2016 and wrote a piece titled, “More Plastic, Fewer Oysters?” This led to a whole National Geographic blog series on ocean plastics. The blogs included interviews with some of the foremost experts on plastic pollution. In October 2016, professional artist and photographer Chris Jordan, famous for his shocking photographs of dead albatross filled with ocean plastic, mentioned Erica’s work to a Danish organization working to quell plastic pollution. Jordan was invited on a trip across the Eastern Pacific Ocean and the organization, called Plastic Change, was looking for an American journalist. Jordan, who knew of Erica through the Safina Center — where he was a Fellow and Erica was a freelance writer — recommended the group bring her on the voyage. Last spring Erica attended one of Jordan’s art shows in New York City and introduced herself. The two talked for hours about art and potential future collaborations. In November, Erica and Jordan embarked on the 54-foot S/Y Christianshavn with members of Plastic Change in an effort to generate publicity about the group’s fact-finding expedition. The vessel used trawling nets to determine the quantity, type and current state of plastic pollution on the Pacific Ocean Gyre, a swirling ocean current sometimes referred to as the Great Pacific Garbage Patch. Aboard the ship, Erica focused on still photography and writing, and Jordan concentrated on filming plastic and the crew at work. Climbing into a patched-up old inflatable dinghy that was launched from the main vessel, Erica and Jordan were set adrift for a half-hour or so. They were entrusted with a waterproof camera bag containing thousands of dollars’ worth of equipment and dealt with setbacks — such as a slow leak that sprayed water everywhere, drenching them. Erica did more than sharpen her journalism skills on the ocean voyage, however. Hytting, or “Ras” as Erica now refers to him, is a Danish carpenter and boat builder with more than three decades of sailing experience. While Hytting was considered to be a stern taskmaster and judge of his crewmembers’ sailing techniques, Erica’s quickness to learn garnered his respect, laying the foundation for a friendship they shared during the six weeks they spent together. Erica adds that even when the ship experienced an engine malfunction and a snapped rudder en route to Hawaii, she never felt that she was in danger because she trusted the crew completely. Even before this ocean assignment, Erica’s writing has appeared in prestigious publications such as The Atlantic and Scientific American. A sampling of her stories in those publications follows. Her work has not gone unnoticed. None other than environmentalist humanitarian movie star Leonardo DeCaprio shared her Scientific American plastics story on his Facebook page; that led to a huge spike in readers and visitors to her own web site. Erica is eagerly bringing her message to the community, which has led to a speaking tour. Although Erica is largely responsible for who she has become, she recognizes that every aspiring trailblazer needs assistance from an established professional, and Erica is grateful for the connections and opportunities Safina gave her. Mentorships are relationships after all, and the mentee must also recognize their value. In the Fall of 2015, Emily Markowitz was a senior graduating with a major Marine Sciences with minors in Coastal Environmental Science, Geospatial Science and Theatre. She was accepted into the Accelerated BS/MS degree program with Dr. Janet Nye in her Fisheries Ecology Lab. Emily is very excited to start doing real, meaningful research and contribute to the scientific community. Emily had a variety of experiences during her time at Stony Brook. She received the Stony Brook Mote Marine Lab Scholarship during the summer of 2015 and spent 10 weeks doing research in a snook release project at the Laboratory’s Aquaculture Park in Sarasota, Florida. She served as the president of the Stony Brook Undergraduate Marine Science Club for two years, and lead the group on activities that included trawling and whale watching trips out of Southampton, seal walks, and volunteering with various organizations such as Coastal Steward and Cornell Cooperative Extension’s Marine Meadow Restoration Program. These organizations have also been included at events like Earthstock. The club also participated in the Pew Charitable Trusts’ Bluefin Tuna Initiative and won a trip to meet with Pew and the head of NOAA fisheries, Sam Raunch, to talk about the Pew initiative. The club continues to provide our community with talks and public screenings of documentaries. For many of the students in the club, these events are their introduction to research and conservation issues in Marine Science. In 2014, Emily also headed a major outreach program in which Marine Science Club members gave presentations (with valuable assistance from Dr. Larry Swanson) to two local middle schools about marine pollution and how it affects Long Island’s local biodiversity. Emily’s experiences as a crew member on the R/V Seawolf, including trips to assist the New Jersey DEP in doing trawls and collecting data for their quarterly stock assessment program allowed her to see, first-hand, the distribution and density of our coastal waters and how a program like this works. Emily’s undergraduate research experiences have allowed her in a number of labs on campus, including those of Drs. Janet Nye, Brad Peterson, and Joe Warren. While each lab pursued different questions and had different approaches and specialties, each experience provided her with greater insight into laboratory structure and methodology. While studying abroad in New Zealand, she also worked for Dr. Steven Wing in his lab. Wing is exploring isotope markers in fish populations. Everything that Emily learned at Stony Brook and all of the extracurricular activities she participated in made her a better candidate for the BS/MS accelerated program and better prepared to write her thesis and, she hopes, “to pursue my Ph.D”. Everyone talks about the weather, but Michael Colbert has more than a casual interest in that topic — he studied it at Stony Brook University. To be sure, the atmospheric and oceanic sciences major can’t remember a time when he wasn’t passionate about the weather. “My mother says that as a baby, there were times when I wouldn’t fall asleep unless she took me outside to look up at the sky first,” Michael said. Michael said that growing up in a waterfront home on the Neguntatogue Creek in Lindenhurst, New York — which gave him a front-row seat to view nature’s full force — influenced his decision to pursue atmospheric and oceanic sciences. The Internet has made it easy for Michael to watch the weather unfold minute by minute on satellite and radar. As early as his freshman year in high school, he paid special attention to weather trends, which led to him posting forecasts on Facebook. When Michael arrived at Stony Brook, he created SBUWeather, a Facebook page managed by the Meteorology Club, which provides forecasts to more than 700 students, staff and faculty on campus and to surrounding communities. Posting through social media helped provide more exposure for the Stony Brook Meteorology Club which enabled it to grow its current membership to 40 weather buffs. After he was elected president, he and his expanded club created a Web page on which they post forecasts. Under Michael’s leadership, the club made its debut at the Involvement Fair, wearing T-shirts the members created. Feeding on a growing interest in the club, Michael began organizing field trips to regional conferences; the National Weather Service in Upton, New York; and local news stations to observe live forecasts. In 2013 “we visited ABC in New York City, and” in fall 2014 “we took a trip to News 12,” he said. To further increase its exposure, Michael initiated the club’s participation in Earthstock the past two years. The club competed in the 2014 Roth Regatta with a boat named “Hurricane Force.” Regatta. In 2014 Michael served an internship at the Upton National Weather Service facility, where he collected data using instruments called radiosondes, which are battery-powered devices carried into the atmosphere that transmit findings by radio to a ground receiver. He is also the proud recipient of the Timothy Magnussen Memorial Scholarship for undergraduate students majoring in atmospheric sciences. During the summer of 2014, he conducted research at Colorado State University, exploring the volume of hail in thunderstorms and associated lightning flash rates. These findings were presented at the American Meteorological Society annual meeting in Phoenix, AZ, in January 2015. Michael helped coordinate a joint effort with the School of Journalism to provide broadcast experience to atmospheric and oceanic science majors. “Even though the National Weather Service is my first choice to start my career path, every time I’m in a newsroom I get an overwhelming feeling of excitement, so I hope I get that opportunity to do that at some point in my life,” he said. Michael started his graduate studies at Penn State in the fall of 2015. “The weather is something that affects everyone every day. It never stops changing, so I can never stop watching it,” he said. According to Danica Warns, “the Marine Conservation and Policy program is a very unique and fast-track graduate program that helped launch my career in environmental conservation.” She appreciated the flexibility to select the classes she wanted to take and how she could “design (her) capstone project to match (her) career goals” that allowed her “to tailor the program to get the most out of my degree.” As she knew she was interested in a career in environmental outreach, Danica chose to take several courses in the Alda Center for Communicating Science. The classes “were so valuable and enhanced my communication skills greatly,” she says. If it weren’t for the flexibility of this program, it would have been difficult for me to meet my goals in such a short period of time. The strong background in current marine conservation issues and communication skills I learned put me in a competitive position for pursuing a career in environmental outreach. She credits the MCP program for helping her get to her current position, working for the NYC Parks Department engaging volunteers in wetland restoration projects. Christopher Martinez may be a marine biologist from California, but he didn’t grow up near the ocean. Visalia, his hometown, is a small farming city in the San Joaquin Valley. His family of migrant workers traveled the West picking crops. “Because of their hard work, I was able to pursue my dream,” said Christopher, who earned his PhD in 2014. As an undergraduate at the University of California at Santa Barbara, his passion for marine sciences solidified. Christopher became research diver certified and was listed as co-author of a study, published in 2011 in Marine Biology, for his research in French Polynesia. When Christopher applied to the graduate program at Stony Brook, the School of Marine and Atmospheric Sciences (SoMAS) awarded him a Turner Fellowship. The W. Burghardt Turner Fellowship helps qualified underrepresented graduate students seeking certain degrees. Since 1987, the Fellowship has graduated more than 400 degree recipients. The Center for Inclusive Education (CIE), which provides Turner Fellowship funding, became Christopher’s second home. “The CIE offered me a support system and a sense of family,” he said. After losing outside funding, the CIE helped Christopher pay for flounder movement pattern research in Long Island bays. Michael Frisk, associate professor in SoMAS and Christopher’s PhD advisor, helped him redirect his research. “Mike told me to design a project that truly reflected my academic interests,” said Christopher. After studying geometric morphometrics with Distinguished Professor emeritus F. James Rohlf, Christopher pursued ecological morphology of skates and rays and spatial modeling of marine communities in the Northwest Atlantic with a grant Frisk helped him secure. Sarah Schaefer is currently the Program Coordinator for the Peconic Estuary Program (PEP). In this job she facilitates the Peconic Estuary watershed protection and restoration projects, monitoring and research. She also assists municipalities and not-for-profits to form partnerships, secure funding and plan and implement water quality improvement and habitat restoration projects. The PEP is a partnership comprised of stakeholders within the estuary. The program is responsible for creating and implementing a management plan to protect the estuary. The Peconic Estuary is one of twenty-eight (28) estuaries in the National Estuary Program (NEP), administered by the United States Environmental Protection Agency (USEPA) under the auspices of Sec. 320 of the Clean Water Act to protect and preserve nationally significant estuaries which are threatened by pollution, development, or overuse. The Peconic Estuary was accepted into the program as an “estuary of national significance” in 1992 after citizen groups formed in response to the Brown Tide algal bloom events in the mid 1980’s and early 1990’s. At that time, it became the 20th National Estuary Program in the country. The Peconic Estuary is located between the North and South Forks of Long Island, and consists of over one-hundred (100) harbors, embayments and tributaries which span more than 125,000 acres of land and 158,000 acres of surface water. Sarah believes that the Marine Conservation and Policy (MCP) Program prepares students for real world careers because you are provided experience in many different areas like environmental/marine policy, marine research, field work, communicating science. The program provides the experience to be competitive for marine conservation and policy programs. She says that “everyone in my graduating class had slightly different interests and the program gave everyone the freedom to pursue those interests. Former Marine Conservation and Policy Masters student Kenneth Lang (fall 2013) was recently selected for the prestigious John A. Knauss Marine Policy Fellowship. The competitive fellowship recruits students from 33 Sea Grant programs nationwide to complete a one year paid fellowship in either the legislative or executive branch of the U.S. government in Washington D.C. Ken’s placement in the program is with NOAA’s International Affairs Office where he will focus on research in Europe, Russia, and the Arctic beginning in February. While in Stony Brook’s Marine Conservation and Policy program, Lang completed an internship with the United Nations Development Programme (UNDP) and the Global Environment Facility (GEF) International Waters Programme, where he studied three dozen transboundary water environmental remediation projects. Lang felt that his Knauss placement was a perfect fit with the skills and knowledge he obtained during his time in the MCP program. Cassie Bauer received her BS and MS from SoMAS in 2009 and 2012 respectively. Her thesis research involved the physical processes that contribute to localized, seasonal hypoxic conditions in the bottom waters of Smithtown Bay, Long Island Sound. In her current role as Fire Island National Seashore’s Public Affairs Specialist, Elizabeth manage press relations, digital media, and lead science communications efforts. She works closely with experts from all divisions within the National Park Service and with researchers and partners to develop communications products for a variety of audiences. Elizabeth says that she “was fortunate enough to be involved in a student training program with the National Park Service during my time at SoMAS.” While managing my studies and a full-time job was not easy, the two programs prepared her well for the work she does now. Jake LaBelle, a graduate of the Marine Conservation and Policy (MCP) Master’s program, has found career success at the New York Seascape. The New York Seascape, a program operated through the Wildlife Conservation Society, seeks to protect habitat and species that rely on New York’s coastal waters. They use a combination of research, education, and policy to achieve this goal. LaBelle works as research coordinator through New York Seascape, a position that helps him engage in his true passion: sharks. LaBelle got involved with New York Seascape by doing an internship with them during his time working on his MCP degree. He got involved in more and more projects until he became indispensable to the organization, at which point he was offered a job. Even before that, LaBelle spent time working with sharks. Prior to attending Stony Brook University, he volunteered at the Bimini Biological Field Station. The Field Station gathers data on sharks in the Bahamas, which is then utilized by universities and professors, including SoMAS professor Dr. Demian Chapman, who does genetic studies on the samples gathered there. These experiences were key for LaBelle, who came from non-scientific background. His undergraduate degree was in International Affairs. A lot of his success came from talking to people involved in the field, who knew some way he could get involved. This included his work in Bimini, and other places as well. “I always loved aquariums and marine biology, and started by volunteering at the National Zoo,” states LaBelle. Currently, LaBelle is working on research on Sand Tiger and Shortfin Mako sharks in the Great South Bay. By tracking these sharks, he is hoping to get more information to construct maps of essential habitat for these species. LaBelle feels that GIS courses taken as an MCP student were indispensable to this work, and that these and other experiences as an MCP student will continue to be useful in his chosen career path. Laura Picariello, former MCP student, is busy pursuing a career in Louisiana with the Gulf United for Lasting Fisheries, part of the Audubon Nature Institute. As a Research Assistant working with a wide variety of audiences, she says the Marine Conservation and Policy program really helped her find her career. The fact that the program focuses not only on science coursework, but communication, environmental law, and policy creates an environment where students can about a vast amount of topics in a short amount of time. This leaves them better prepared to find a career, maybe not even one they had expected. Picariello was traditionally trained as a musician, but found that she couldn’t live away from the ocean. She choose the Marine Conservation and Policy program in order to change her career pathway and improve her job satisfaction. What other advice does she have for current or prospective students wishing to do the same? Christopher Lang, a graduate of the Marine Conservation and Policy (MCP) Master’s Program, is using his degree to make a difference in environmental policy. Lang, who graduated from the MCP program in 2012, works as a Legislative Fellow in the New York Senate. The prestigious Legislative Fellowship Program, which accepts graduate students from a variety of programs, pairs students with New York Senators to do legislative research and write policy. Lang is working with Senator Catharine Young whose work in agriculture and environmental policy is a good match for Lang’s interests and abilities. Lang hopes to focus on aquaculture policy during his time in the New York Senate, and attributes much of his professional success to the MCP program and to the courses he took during his time at Stony Brook University. “I definitely wouldn’t be in a position to get this job without the MCP program,” says Lang. The MCP program allows students to tailor their degree, offering courses in environmental law and policy, science communication, and other more traditional science-based conservation classes. After students complete their coursework, they complete a capstone project or internship, where they apply the skills developed in classes to real-life scenarios in the workplace. Lang chose to participate in an internship with the Mystic Aquarium as an educator, a position that gave him some extra experience in communication. “I never dreamed this was where it would take me. Use the diversity of the program to your advantage,” Lang advises current and prospective students. Lang certainly has done that. Having received a Bachelor’s degree in Biology from Providence College, he took Environmental Law classes as an MCP student, which helped him understand and become familiar with court and law documents. However, Lang believes the science communication courses were the most beneficial for him. “Those courses can prepare you for anything. I had a lot of fun in my improvisation course, and learned so much as well,” states Lang. Looking forward, Lang plans to use the connections and skills he gains as a Legislative Fellow to his advantage in future work with environmental policy, either in a state or federal agency or in a private firm. John Holden aboard a lobster boat in Long Island Sound, bespattered with mud but still smiling. John transferred to Stony Brook-Southampton campus for the fall 2007 semester as a Marine Science major and graduated in spring 2011 with a Bachelor of Science degree. As an undergraduate, he took a suite of marine-related courses – all of Physical, Biological, and Coastal Oceanography, as well as Long Island Marine Habitats and Experimental Marine Biology. These experiential classes gave John the opportunity to get out on the water and gain practical experience to compliment what he was learning in the traditional classroom setting. While a student, John also became involved in a number of research projects. 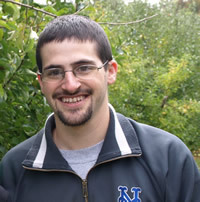 In 2010, he was an intern in Dr. Chris Gobler’s lab at Southampton working on mesocosm experiments pertaining to the Shinnecock Bay Restoration Project (ShiRP). During that summer, he also participated on the Southampton Blue Oyster Project (S-BOP), where he worked for Drs. Kurt Bretsch and Joe Warren monitoring oyster growth and water quality conditions at several locations within the Shinnecock and Peconic Bays. After graduation, he continued working as a technician on the ShiRP project, as well as crewing on the research vessels out of the SoMAS Southampton Marine Station and on SoMAS’s R/V Seawolf out of Port Jefferson. John is currently working for the Marine Program of Cornell Cooperative Extension of Suffolk County as a fisheries technician. He is working on two different projects. John works on the lobster pot retrieval project in Long Island Sound, working with local fishermen to retrieve derelict lobster pots. The second project involves testing new fishing gear aimed at reducing by-catch. He has worked on ocean trawlers testing out new gear for the summer flounder fishery aimed at reducing sea turtle by-catch, as well as new gear for the squid fishery. Morgan Gelinas (MS, 2011) studied ship wakes in the Venice Lagoon, Italy. Here, very large ships routinely navigate a deep dredged channel cut through a shallow lagoon. The wakes they create propagate over the adjacent shoals for long distances, resuspending sediment as they go. Morgan described these wakes as Bernoulli waves, or non-linear N-waves, using the same equations that govern the propagation of tsunamis over the deep-ocean basins (Gelinas, M, H. Bokuniewicz, J. Rapaglia, and K.M.M. Lwiza, 2013. Sediment Resuspension by Ship Wakes in the Venice Lagoon Journal of Coastal Research: Volume 29, Issue 1: 8-17. doi: http://dx.doi.org/10.2112/JCOASTRES-D-11-00213.1). She is now a scientist specializing in marine geology and hydrodynamic processes working for EA Engineering, Science and Technology, Inc. EA has offices from Guam to Maryland and Morgan is leading many of their field efforts. Her professional duties include such a diverse array of studies such as sediment testing, ocean permitting, marine bathymetric surveys, aquatic site characterizations, interpreting ecotoxicological and bioaccumulation/tissue testing and analysis. Morgan is currently working on a site characterization study in Duluth, MN in the St. Louis River/Lake Superior area, but she has been in most of the Great Lakes in the past two summers on EPA projects. She routinely pilots the boat for bathymetric work or coring all over in the Chesapeake Bay, Gulf of Mexico and greater NYC area. Graduates from the Marine Conservation and Policy Program are prepared for a variety of careers, including jobs in the government, non-profit, and private sectors. One recent MCP graduate, Hazel Wodehouse, is training the next generation of ocean scientists at Suffolk Community College on Long Island. Since graduating from the MCP program, Wodehouse has been teaching courses such as Environmental Issues and Introduction to Oceanography as an adjunct professor. Wodehouse finds that after taking her courses, her students have a deeper connection with the environment and the marine habitats that surround them. She described a particular experience about a year ago when she took students to see a whale necropsy. Wodehouse attributes the MCP program for helping her being successful in her career. Courses required by the program in communicating science were among her favorite, and got her interested in teaching. The one-year program allowed her to get a quality education in a short amount of time. What is her advice to the current class? “Take advantage of as many opportunities as you can. Even if you don’t initially think you’ll be interested in something, you might surprise yourself,” says Wodehouse. KESTREL PEREZ graduated in 2011 with her PhD in marine and atmospheric sciences. Under the advisement of Professor Stephan Munch, Kestrel’s dissertation examined the evolution of size in fish and evaluated the strength of natural selection and the presence of prolonged trade-offs from an early period of fast growth to better understand the evolution of size. She joined the School of Marine and Atmospheric Sciences in 2005 as a scholar in the Alliance for Graduate Education and the Professoriate, and is a recipient of the Dr. W. Burghardt Turner Fellowship. Upon completing her PhD, Kestrel went on to a postdoctoral position at the University of Texas at Austin in the Department of Marine Sciences. Kestrel is an assistant professor of biology at St. Joseph’s College in Brooklyn, N.Y., where she is teaching courses in marine biology and evolution and ecology, and mentoring undergrad researchers. Her research centers on marine biology. Specifically, she focuses on fish and invertebrate evolutionary ecology, the study of life history traits and maternal investments, and how variation in these areas influences larval fitness and recruitment. Katie’s advice for current students in SoMAS are to meet with your professors outside of class, find a good physical space for studying, conduct research that you are passionate about and take advantage of the SoMAS advisers expertise. Tim Davis graduated from SoMAS in 2009 with his Ph.D. Before he came to SoMAS, Tim attended Southampton College of Long Island University, where he received his Bachelor of Science degree in marine science-biology. It was at Southampton that Tim first worked with Professor Chris Gobler investigating harmful algal blooms as an undergraduate. After taking a year off upon graduation, Tim decided to attend SoMAS so he could work with Gobler again. This time, Tim would be investigating the environmental factors that influence toxic and non-toxic strains of freshwater cyanobacterium, Microcystis spp., throughout the northeast USA. For the past two years, Tim has been working as a Research Fellow with the Australian Rivers Institute at Griffith University where he investigated how different environmental factors promote the production of a toxin by a harmful algal species, Cylindrospermopsis raciborskii. He was recently awarded a prestigious Queensland Smart Futures Fellowship to use an advanced molecular technique to further investigate how toxic cyanobacteria communities respond to a changing climate. He is ever grateful for his time at SoMAS. Tom Di Liberto grew up on Long Island and has been fascinated by the weather since he was a young child. At SoMAS, Tom studied under professor Brian Colle of the Institute for Terrerstrial and Planetary Atmospheres (ITPA) and worked with the School’s Storm Surge Research Group. His thesis dealt with storm surges affecting the New York metropolitan region. After earning his Masters degree in Atmospheric Science/Meteorology in 2009, he joined the Climate Prediction Center of the National Oceanic and Atmospheric Administration (NOAA), where he works as a meteorologist forecasting the weather for Africa, Central America, Hispaniola, and Central Asia with a focus on weather hazards that could affect food security. In addition, Tom conducts research on the use of satellite-derived rainfall estimates in these regions. His research group’s studies took on a whole new level of importance during the past year due to Super Storm Sandy. In 2013, Tom won the “America’s Science Idol” competition. The “America’s Science Idol” competition was sponsored by the National Science Foundation’s Office of Legislative and Public Affairs, Discover Magazine,Popular Science and the Point of Inquiry Podcast. Patterned a bit after “American Idol”, the fun and engaging workshop was designed to help scientists and engineers communicate with non-technical colleagues and audiences. In winning, Tom brought home some nice loot, viz. : 1-year subscriptions to Discover and Popular Science; a live guest appearance on the Point of Inquiry podcast and the Discover DVD, as well as a variety of opportunities to visit and link with science communication groups around the country. The Science and Resilience Institute at Jamaica Bay (SRIJB) and New York Sea Grant are happy to announce the arrival of Helen Cheng as the Specialist for the New York Sea Grant’s Jamaica Bay Coastal Resilience. Helen will be designing outreach programs to support community engagement and research efforts to enhance resilience for the communities within the Jamaica Bay Watershed. Cheng comes to SRJIB from a yearlong stint as a John D. Knauss 2015 Marine Policy Fellow at the National Oceanic and Atmospheric Administration (NOAA) Sea Grant, a highly competitive fellowship program among the nation’s highest qualified graduate students. She was the Coastal Communities Specialist working in the National Sea Grant Office in Silver Spring, Maryland, where she synthesized Sea Grant Network research and extension activities surrounding coastal community sustainable development, hazard resilience, and climate change adaptation. She was on the NOAA Coastal Hazards Resilience Workshop Planning and Support team, and assessed institutional and network research portfolios from the 33 programs of the Sea Grant Network to help identify priorities of the National Sea Grant College Program. Helen was selected a Knauss Fellow from the New Hampshire Sea Grant program. At the University of New Hampshire she earned her M.S. in Zoology with her research on horseshoe crabs. In New England, she also worked with lobsters and scallops, was a UNH teaching assistant, and a naturalist at the nearby Seacoast Science Center. Helen earned her B.S. in Biology from Stony Brook University in 2009 where she was selected for the first-ever Stony Brook Mote Marine Laboratory internship. David Novak is the Director of the National Weather Service’s Weather Prediction Center in College Park, Maryland where he oversees national forecasts for heavy rainfall, snowfall, and hazardous weather. He received a PhD from SoMAS where his research involved numerical models to understand hazardous weather conditions and predict their occurrence. David’s interest in weather has been life-long. “Growing up in the extremes of Minnesota, I’ve been fascinated with the weather, and in particular, snowstorms.” His dissertation work was an extension of this passion, where he studied localized heavy snowfall events, also known as mesoscale snowbands. David was pushed to “think even bigger, work even harder, and achieve even more” at SOMAS. His advice for students is to seize opportunities that take us out the our comfort zones and expand our thinking. Early on in her training as a dancer, Carolyn Hall ’09 had to learn to be able to pivot quickly. Who knew it would have such valuable application as a life skill? Hall, who holds an MS in Marine Science from Stony Brook University’s School of Marine and Atmospheric Sciences (SoMAS), conducts her own historical marine ecology research, has been part of a team studying the ecosystem of the Gulf of Maine under Adrian Jordaan of the University of Massachusetts, works as the research assistant and fact-checker to New York Times best-selling author Paul Greenberg, and leads workshops for the Alan Alda Center for Communicating Science at Stony Brook. As if that weren’t enough, she continues to perform as a contemporary dancer, having recently completed a residency on Governors Island with Works on Water and performed in a New York Times-featured piece by choreographer Carrie Ahern. A winner of the New York Dance and Performance “Bessie” Award for performance in 2002, she also serves on the boards of the Interdisciplinary Laboratory for Art Nature and Dance (iLAND) and Culture Push. Hall recently took a few moments to breathe at her home in Brooklyn – where she lives with her husband, actor Kelly AuCoin (best known as “Dollar” Bill Stearn on Billions and Pastor Tim on The Americans) – and discuss her multifaceted career. The best place to start is probably your work with the Alda Center. Tell us a bit about the kinds of programs you run and what you’re doing. This is my fourth year teaching at the Alda Center, and officially, I’m a message design or “Distilling Your Message” instructor. I work with graduate students, post-graduates, and some professors, taking them through a five-week course where they work on talking about their science and their research in a way that’s for audiences who aren’t academic, and aren’t in their specialized field. It’s really fun, actually. We work on one-minute pitches or talks, conversations, storytelling, get them in front of a camera to be interviewed by journalists, and we do writing exercises, too. It’s pretty intense, but it’s only once a week. I also work with the Alda Center and go on the road to various organizations and institutions – other academic institutions, or NASA and other government institutions – and work with professionals and faculty members and undergraduates and graduates, and we do the same thing, but we team teach with acting improvisation instructors as well. And because the Alda MethodTM is based on Alan Alda’s experience as an actor and as host of Scientific American Frontiers, does it help that you approach this with an arts background of your own? That’s certainly what drew me to it. I thought, “I have both halves!” I wasn’t trained in acting improvisation, but in dance improvisation; I’ve done a lot, and still do. So yes, I think having a performance background made me interested in communicating my research differently. I wanted to be able to talk to the random people who came up while I was in the field, asking what I was doing. I wanted to be able to explain it to them. I wanted that audience to have access to what I was doing, because I was excited about it. It felt very connected to being a dancer, being a performer, and wanting your audience to come along with you. Even though dance doesn’t necessarily use verbal language, there’s a desire to have the audience physically or tangibly follow you and have some sort of interpretation of it that you’ve helped communicate to them. Obviously, you had already been here for your graduate degree, but what was your path from graduating and doing the research that you’ve been working on to coming back here to work with the Alda Center? Christine O’Connell was one of the designing founders who worked with Alan for the Alda Center. We were colleagues at SoMAS and friends already, and she was going through the initial sessions with Alan when he was testing out the improv and “Distilling the Message” exercises in tandem. For years, she was saying, “You should do this, you should do this, you should do this. You’re a scientist and a dancer, a scientist and an artist.” I finally found myself with a window of time where I said, “I could go explore and train in this.” As soon as I did, it felt like something I had to do. You mentioned the difference between improvising as a dancer and as an actor. Your husband is something of an “in-house consultant,” so to speak, when it comes to acting. Are there things you work on where you find you want an actor’s perspective and you consult Kelly? Kelly does know the kind of acting exercises we use – he’s done them at one point or another – but honestly, I consult the improv instructors who are part of the Alda Center, because they know how we’re applying it to working with scientists and working in communication beyond acting. Working in the Alda Center, and being married to a prominent actor yourself, have you ever had the opportunity to bring them together? Because I only work with the Alda Center part-time, I haven’t had that many interactions with Alan, but I did bring Kelly to a mixer in New York City, and I got to introduce them. There were a lot of people around, but they had a nice warm, brief chat about acting. Alan is one of those spectacular actors that Kelly has watched and admired since he was a child – so meeting him was meeting one of those icons of the acting world. It was really fun for them to meet, and I was just standing there beaming at the fact that this was happening, because Kelly was really excited to meet him, and Alan was very warm. He’s a very nice and approachable person, and they definitely connected over acting and the theatre world. At the Alda Center, you bring your arts background into science, but you also have this other component to your career, where you bring your science background into the arts. That seems like a very different process. How does it work? It’s different with each organization and each project. I think that the artist brain and the science brain work very similarly. There’s experimentation, there’s failure, and there are many trials. There’s an innate curiosity in your own practice or research, and also in the world around you, whether it’s a specific microscopic world, or a world of movement, or a world of sculpture, or whatever the art may be. The practices of being a scientist and being an artist are not so dissimilar, and what’s interesting is that when approaching a scientific topic from an artist’s point of view, there’s a different way of questioning, a way of representing the topic that, to me, is rather freeing: “What does it feel like?” That gives a different lens of looking at the science. So, you might start digging into deeper details of the science from an angle you didn’t expect, which is fascinating. You talked a little bit about the process that brought you to the Alda Center. Can you tell us a bit more about the journey that led you to this amazingly varied career? I grew up in Los Angeles, and although I wasn’t right on the coast, I loved going to the beach and I loved tide pools. So, I’d say that tide pools were my first fascination having to do with marine life and the marine environment, but I didn’t think I was going to pursue that at a young age. When I went to Oberlin College as an undergraduate, I was more interested in human physiology. I was already a dancer, and ran track, and they fit very nicely hand in hand, and so my degree was in biology with a focus on human physiology. Then, because it’s easier to pursue a career in dance when you’re young than when you’re older, I did work in physical therapy for a number of years, but I was becoming a professional dancer, in LA first, and then in New York. After ten years of that, I was missing digging into the science side of my brain, and I spoke to professors at UC Santa Cruz, because their marine biology program was in my mind from high school as the place to go. One of them said, “You know, there’s a really good marine science program in New York.” I said, “Really?” They said, “Yeah, at Stony Brook.” I had not heard of it, but that’s because on the East Coast, I wasn’t exploring that as a real option. I went out to Stony Brook and took a couple of upper-level undergraduate marine science courses at SoMAS, and I loved them both for very different reasons, and I thought, “this is what I’m going to do.” However, I still felt like I needed a little more exposure, so I did an internship at the Southwest Fisheries Science Center in La Jolla. That was the first place where I thought, “This is what being in the field is. This is what being among the public doing marine research is. This is what a full-time commitment to research that’s on computers, that’s on equipment, that’s talking to your colleagues, in the field, on a boat, is about,” and I was hooked, no pun intended. When I applied for grad school and hoped to get in, I wrote about that internship experience, and realized that sort of public interaction with research was fascinating to me. I thought I would stop dancing, and for the first semester of graduate school, I couldn’t dance, because it was so intense, and I’d been out of school for so long that my learning curve was super-steep. But then, the dancing side of my brain still needed to be attended to, so I do both. Having been here as a grad student, gone out to do your research, and then come back to work with the Alda Center, are there things you appreciate about Stony Brook now that you didn’t necessarily see as a student? I think what’s most impactful about teaching a course that sees scientific researchers from many departments at Stony Brook is realizing what a deep community of scientists and research and study there is at Stony Brook. Sometimes, there are misconceptions about state schools and what they can offer in terms of excellence in various departments. Some schools are known for business, or known for chemistry, but I feel like at Stony Brook, not only is there this incredible medical school – which I think we are known for – but the rigorous pursuit of all the different sciences that I see reflected in the graduate students and the postdocs, is really impressive, and I feel lucky that I get to talk to such a really great cross-section of them through this scientific communication class. Obviously, there’s something that you bring to these students when you work with them in these communication classes. How much do you find yourself taking back with you in terms of learning about their research? That’s the beauty of having the Alda Center at Stony Brook. Because I am working with these scientists, these engineers, these medical students, who are gaining expertise in these fields – and they’re learning how to talk about it – they have to break down what their research is. They are so skilled at saying what their work is academically. I don’t understand all the words or all the processes, but because I get to work with them on understanding it, so that someone like me, who’s not in their field can understand it, I actually can walk away with an understanding: “Wow, you’re really working on trying to understand why people with schizophrenia often hear voices. Where’s that coming from? If we can figure out where it’s coming from in the brain, then maybe we can find a way to reduce it or help control it better.” I can walk away with an understanding of what cutting-edge research these students and their labs and their professors are working on, and that’s exciting. You talk about the two sides of your brain that need attention, the science side and the dance side. What would you say to current students who may have their own seemingly divergent passions about how you manage to serve both, indulge both, and use both in your career? There are so many multidisciplinary folks out there now, or hybrids, and I think more and more collaborations between scientists and people in other disciplines are happening. I encourage students to entertain their hybrid interests, partly because it makes them relatable to more audiences, but I also think that it’s important to remember that as a scientist you have all these different sides of you that are equally rich. How do you have a career that way? That’s a tricky thing. If you’re going to try to do what I do, I’m freelance everything, but I have other friends who are full-time researchers and they create theatre pieces, solo shows, that aren’t about science…or maybe they are, but not necessarily. It is possible. You just have to figure out what your main goal is, what you want from each discipline. I think that’s the key. That’s the question to ask yourself, but it is possible. Did you check the weather report today? Then you probably know Katherine Rojowsky’s work. Katherine, an Atmospheric and Oceanic Sciences major, credits “amazing internships” with helping her mature as a meteorologist. At WCBS-TV, Katherine prepared weather graphics and forecasts that were broadcast to millions of viewers and used by the Weather Channel. Private forecasting companies MetroWeather and Weather 2000 Inc. asked her to make weather predictions used by film and television production companies, golf courses, and local sports teams like the Mets and Long Island Ducks. Jae Lee received both her PhD and MS from SoMAS, graduating in 2008. For her master’s thesis, Jae looked at radiative transfer modeling with Professor Bob Cess to estimate the earth’s radiation balance. Her PhD conducted under the direction of Professor Sultan Hameed focused on how the sun can influence Earth’s climate. Lora Clarke received her Ph.D. from SoMAS in 2007. She also has a Bachelor of Science degree from Christopher Newport University in Virginia and a Master of Science from the University of Massachusetts. At SoMAS, she worked with former Dean David Conover on numerous fish ecology studies involving Atlantic silversides, Menidia menidia. Lora’s research concentrated on the population dynamics and connectivity of subpopulations of this species along the east coast of the United States. After she graduated, Lora was awarded a prestigious John A. Knauss Marine Policy Fellowship by NOAA in 2008 and began working with the NOAA Fisheries Office of Science and Technology in Silver Spring, Maryland, where she served as the Ecosystems Project Coordinator. Her duties included assisting Dr. Steve Murawski, then NOAA’s Chief Scientist and Head of Scientific Programs, on programs related to ecosystem-based management. She also prepared international policy briefs and reports for Congress and helped administer CAMEO (Comparative Analysis of Marine Ecosystem Organization) – a new grant program co-sponsored by NOAA and the National Science Foundation. After her one year fellowship ended, Lora was hired to stay on at NOAA to work on CAMEO. Currently, Lora develops goals and priorities for interdisciplinary ecosystem research, coordinates scientific review of research proposals and creates outreach plans to help promote the CAMEO program. In addition, Lora works with JSOST, the Joint Subcommittee for Ocean Science and Technology. JSOST is a group of 25 federal agencies organized under the White House Office of Science and Technology Policy that sets the national priorities for ocean science and technology research. Lora is one of two executive secretaries for the group. Lynn Abramson has a forged a career path that began in marine science and now influences environmental policy on a national level. She was a Ph.D student at SoMAS from 2001 to 2007 working with Bob Aller and Cindy Lee on the biological carbon pump and related biogeochemical processes. Her dissertation focused on how mineral interactions influenced the decomposition of sinking particulate organic matter, using pigments and amino acids as tracers. She recalls knowing early in her time at SoMAS, that she wanted to apply her scientific knowledge in a way that could benefit others. Upon graduation, Lynn received the prestigious John Knauss Marine Policy Fellowship sponsored by the National Oceanic and Atmospheric Administration’s Sea Grant program. Her one year fellowship morphed into more than five years of work on oceans, public lands, water resources, energy, and transportation issues when she joined the staff of U.S. Senator Barbara Boxer (D-CA). After leaving Senator Boxer’s staff Lynn joined the Clean Energy Initiative with The Pew Charitable Trusts where she coordinates their Clean Energy Business Network, that informs and engages over 3,000 clean energy business leaders. At this non-profit, non-partisan organization, she currently conducts research and works on “federal policies to promote cleaner and more efficient sources of energy. Lynn applies her scientific understanding of complex environmental problems to practical solutions that can be implemented by businesses across the nation. According to Lynn “having a strong foundation in science has given me a much deeper, more holistic understanding of the environmental issues I’ve worked on in my policy career. My Ph.D. work trained me in objective thinking—keeping an open mind and weighing conflicting information and perspectives before making a decision.” Lynn is an excellent example of how a rigorous education in the sciences can be applied to a career in environmental policy. Hudson Roditi received a Ph.D from SoMAS in Coastal Oceanography in 2000, working in Nick Fisher’s lab. His thesis was titled “Rates and routes of trace element uptake in zebra mussels.” The zebra mussel is an exotic invasive freshwater species that was introduced into the Great Lakes accidentally in the mid-1980’s and has since invaded freshwaters in much of North America. Hudson is the program director of the Urban Advantage Middle School Science Initiative at the American Museum of Natural History in NYC. He now works with over 220 schools, 640 teachers and over 60,000 students at the American Museum of Natural History, the Bronx Zoo, Brooklyn Botanic Garden, New York Aquarium, New York Botanical Garden, New York Hall of Science, Queens Botanical Garden and the Staten Island Zoo. He helps teachers learn how to shift their perceptions of science away from being memorization of facts and more towards a way of explaining the world and gaining new knowledge. According to Hudson, his success was due in part to his advisers who were “supportive of my choice to explore and find the right path for myself after SoMAS.” He encourages other students to do the same by finding their place at Stony Brook University. Bees are considered the world’s most important pollinator of food crops. In fact, it’s estimated that one third of the food that we consume each day relies on pollination, mainly by bees. Alumna Laura Klahre, ’97, witnesses the importance of that very fact every day. Laura and her winemaker husband Adam Suprenant own Blossom Meadow Farm, in Southold, New York, where she grows strawberries, raspberries, and blueberries, and cover crops of turnips, canola, and buckwheat. While she got her start in farming with honeybees more than twenty years ago, none are found at the farm anymore. All crops are pollinated by native bees, including the gentle, easy-to-raise mason bee. Klahre is quick to point out that honeybees are an invasive species and that an overwhelming amount of evidence has proven their negative impact on the natural world. “In addition, native bees pollinate two to three times better than honeybees and the resulting fruit is heavier, more well-rounded, and higher quality,”said Klahre. Blossom Meadow Farm is well known for its red raspberry, black raspberry, strawberry and blueberry jams, as well as selling high-quality mason bee cocoons. Thanks to her efforts, more than 100 families have begun raising mason bees, also known as bee ranching. Wine-lovers on Long Island’s East End may know Laura as the co-proprietor of Coffee Pot Cellars in Cutchogue, where she runs a Merlot for Monarchs campaign. As part of the campaign, the farm grows a butterfly milkweed plant (Asclepias tuberosa) for each bottle of merlot sold at the winery. She then works with libraries and Girl Scouts to plant and restore monarch butterfly habitat throughout Long Island in June of each year. “Monarch butterflies will only lay their eggs on milkweed and scientists estimate that more than 1.3 billion stems of milkweed will need to be restored for the species to bounce back,” said Klahre. Coffee Pot Cellars also showcases a Cyser, which is a hard cider made from apples pollinated by Klahre’s mason bees and that uses the traditional French Champagne sparkling wine method, méthode Champenoise. On a cold, windy day in late March, it’s hard to imagine the farm abuzz with bees and brimming with the food they crave. Her husband will join her to tackle farm chores later in the day, but for now her only assistant is Beasley, a pug who follows her everywhere, silently. One taste of her red raspberry jam is all the proof you need that she heeded her dad’s counsel, and that the world is a better place thanks to pollinators. “The interdisciplinary emphasis of the marine science program at Stony Brook has been one of its great strengths and prepared me well for my current position as an associate professor of environmental science at Rutgers University. In my research, I have recently been occupied tracking down mercury in some of our urban coastal waters, which as this photo of the New Jersey Meadowlands attests, should not be thought of as beyond repair. I am often struck by the importance of the experiences I had at MSRC that were not directly related to my graduate research. In 2015 Lisa was was named Head of the Ocean Section Division of Ocean Sciences at the National Science Foundation (NSF). Before this prestigious assignment, Lisa served as the Program Director for Antarctic Integrated System Science in the Division of Polar Programs at NSF. Lisa has served as chair of the UNOLS Arctic Icebreaking Coordinating Committee, and is the recipient of both the Arctic and Antarctic Service Medals, and the Distinguished Public Service Award from the U.S. Coast Guard. Prior to joining NSF Lisa was a faculty member at East Carolina University, also serving as the Associate Vice Chancellor for Research. “The degree of collaboration between faculty, and the level of respect and camaraderie afforded graduate students by the faculty is what made my project possible, and what makes the MSRC environment truly unique. Since leaving MSRC, I’ve become an actual seagoing oceanographer, and I appreciate my multidisciplinary training all the more. My journeys have taken me to the Arctic Ocean four times in the last six years. In 1992, Sanjay Gupta obtained his MS degree from Stony Brook in Marine Environmental Science, which he describes as “an excellent research and academic environment consisting of dedicated faculty and great facilities.” His focus was in physical oceanography with a thesis project developing numerical models that coupled biological and physical processes associated with the lifecycle of estuarine copepods, taking into account the impacts of climate change and how they could affect fisheries. Hans Dam attended SoMAS, known as the Marine Science Research Center (MSRC) at the time, for both his Master’s and Doctoral degrees. After graduating from the University of Washington as an undergraduate in 1982, Hans came to Stony Brook to work with Dr. William Peterson. He received his MS in 1985, but stayed to work on his PhD with Dr. Peterson, finishing in 1989. During his time at the MSRC, Hans studied patterns of copepod abundance and grazing in Long Island Sound. After leaving SoMAS, Hans spent a year as a post-doc at the University of Maryland’s Horn Point Laboratory. He was hired as an assistant professor at the University of Connecticut in 1991 in both the Department of Marine Sciences and the Department of Ecology and Evolutionary Biology. He has been at UConn ever since, and is currently the Acting Head of the Department of Marine Sciences and the Acting Director of the Marine Science and Technology Center. Hans’s research interests include plankton ecology and evolution, the role of zooplankton in biogeochemical cycling and fluxes of organic matter. Much of his current research focuses on plankton communities in Long Island Sound, including monitoring zooplankton populations and examining how they can control harmful algal blooms and how they respond to projected changes in temperature in the Sound associated with climate change. Hans also investigates harmful algae such as Alexandrium and how grazers respond to these blooms. He is in charge of the process studies of LISICOS, the Long Island Sound Integrated Coastal Observing System (http://lisicos.uconn.edu/). Several faculty at UCONN are conducting studies dealing with the control of hypoxia in the Sound. The contribution of Hans’ group to LISICOS is the study of downward fluxes of organic matter and grazing in elemental cycling in the Sound. Greg Marshall is the Executive Director and Producer of Remote Imaging at National Geographic Television and Film. In 1991, Greg began working with National Geographic Television and established the Special Projects Unit, where he developed the technology known as the Crittercam. The Crittercam is a revolutionary tool that has been used to study the behavior of almost 40 different marine and terrestrial species in their natural habitat. He has received two Emmy Awards for the National Geographic specials Great White Sharks and Sea Monsters: Search for the Giant Squid. Greg also produced the film Tiger Shark and a 13-part series called Crittercam for National Geographic television. He earned a bachelor’s degree in international relations from Georgetown University. Greg earned his master’s degree (1988) in marine environmental sciences from the Marine Sciences Research Center at Stony Brook University. His research focused on the factors influencing the burying behavior of juvenile queen conch, Strombus gigas. Greg Marshall returned to SoMAS in 2017 to help us celebrate our 50th Anniversary as the Akira Okubo Distinguished Scholar. Aquaculture specialist Gregg Rivara has a certain affinity for Long Island. He grew up in Queens, received his Bachelor’s degree from Southampton College of Long Island University (now a satellite campus of Stony Brook) in 1982 and, soon after, began his Master’s degree at the Marine Science Research Center (now SoMAS). When he first arrived at MSRC, he had a research assistantship with Dr. Doug Capone and Dr. Ed Carpenter working with bacteria and microalgae, but Gregg’s true passion was shellfish. That’s when he connected with Dr. Robert Malouf, who helped Gregg receive a Sea Grant scholarship to pursue work with hard clams. His Master’s thesis examined how light and flow affect burrowing of very small, recently-set hard clams. While Gregg was finishing his thesis, a job became available as a grant-funded lab technician at MSRC, so he remained in the family for a few months after finishing in December of 1985. However, Gregg was getting ready to settle down and decided that he needed to find work that wasn’t based on “soft money”. He took his Civil Service test and, in 1986, was hired by the Town of Islip as a Bay Management Specialist. While there, he participated in a variety of tasks, including buoy placement, planting of adult clams in spawner sanctuaries and building a shellfish nursery system in East Islip, which later became the Town’s shellfish hatchery. However, Gregg’s stay with Islip was a brief one. After less than a year, he signed on as an Aquaculture Specialist with Cornell Cooperative Extension of Suffolk County (CCE). Gregg, still with CCE, is now Director of the Suffolk County Marine Environmental Learning Center. The Center, located at Cedar Beach in Southold, New York – on the North Fork of Long Island – triples as a working shellfish hatchery, an operational base of bivalve and habitat restoration programs and an educational facility. On any given day, Gregg could deal with a very mixed menu of tasks, from tours, to problems keeping the Center’s boats afloat and running, to assisting prospective shellfish farmers with permitting, to planting shellfish as part of an environmental restoration project. Plus, when he runs out of cool things to do, there’s always the administrivia that comes with the job title, “Director”. Gene Carl Feldman is an oceanographer at NASA/Goddard Space Flight Center. Currently, he is the project manager of the mission called SeaWiFS (Sea-Viewing Wide Field Sensor). Prior to his work with SeaWiFS, Gene worked with the Nimbus-7 Coastal Zone Color Scanner project. Gene has contributed to many additional programs, including the Joint Global Ocean Flux Study, Coastal Rhythms Exhibition at the New England Aquarium and the Jason Project. He has participated in several JASON expeditions including the JASON VII expedition when he explored the depths of the sea on board a United States Naval nuclear research submarine. After earning a bachelor’s degree in biology at Stony Brook University, he spent three years as a Peace Corps volunteer in Western Samoa. Gene worked for the National Marine Fisheries Service and New York Sea Grant before returning to Stony Brook. Gene received his master’s degree (1983) in marine environmental sciences and his Ph.D. (1985) in coastal oceanography from the Marine Sciences Center at Stony Brook University. His doctoral research focused on satellite observations of phytoplankton variability in the eastern equatorial Pacific. Meteorologist Craig Allen is the most authoritative weather source in the New York tri-state area. Heading WCBS 880’s weather team and CBS 2’s weekend team, Allen’s reports are accurate and authoritative, his manner warm & friendly. Craig earned his meteorology degree from Stony Brook University in May of 1979 and became chief meteorologist for WCBS 880 the following Spring. The last 20 years have allowed Craig to form a special bond with WCBS listeners. Hundreds of letters to Newsradio 88 over the years confirm that listeners trust the accuracy of his weather reports. At age 12, Craig Allen lugged a chalkboard to the kitchen table each night and pretended to be a TV weatherman, delivering a forecast to his family while they ate dinner. Today, audiences hear him deliver TV and radio reports locally and nationally, every weekday morning and weekends when the weather is severe and the need to have the best meteorologist in New York City arises. Despite Craig’s serious outlook, he finds his work to be enthralling. “I love my job. I try to convey my interest in weather to the audience. If there is severe weather. I’ll try not be overly grim but I’ll sure get the sense of urgency across to the listener! And if it is a nice day. I’ll try to make them ‘feel’ the weather; to bring it inside since so many people are indoors looking out the window during their workday”. “I cherish it by: Sitting outdoors, watching the weather with my son, spending time at the beach, traveling by train and doing all gardening and landscaping around my home”.